The Open Group announced TOGAF 9 a couple of days ago in San Diego. WHAT better occasion to start a new blog on business and technology than the first full-blown public enterprise architecture framework? As a TOGAF veteran and one of the first to certify back in 2004 I’ve been deeply involved with TOGAF for many years and particularly interested to see how the long-awaited TOGAF 9 would turn out. TOGAF 9 is a major step forward for enterprise architecture. 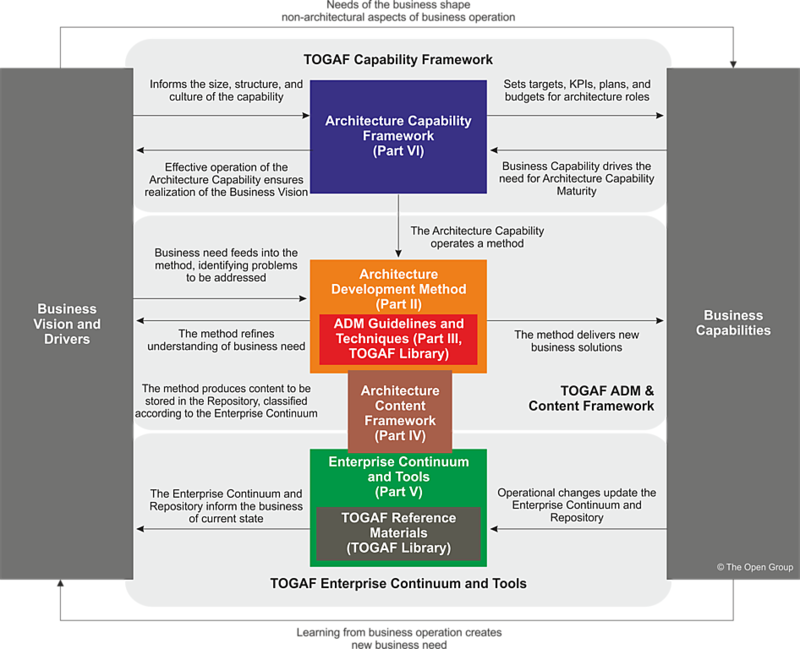 For the first time, TOGAF 9 puts out a complete enterprise architecture framework to the public, covering the full spectrum of the content to describe it, the process to do it and capability needed to enable it. For many years, companies have turned to frameworks like Zachman and others for guidance on achieving control and flexibility of their business and technology landscapes, only to find that these frameworks are incomplete and each with a specific focus. Companies has been left to ‘mix and match to suit their needs’ (Randy Heffner, Forrester), ‘just choose one and use it’ (Bruce Robertson, Gartner), or in reality often buying consultants or simply stop using enterprise architecture as strategy. Not any more. Now, TOGAF 9 offers a one-stop shop that makes significantly easier for enterprises to adopt and realise the benefits of enterprise architecture. The single biggest news about TOGAF is a new, mature, well-defined architecture content framework of 170 pages, built on the experience of major systems integrators through hundreds of architecture projects. 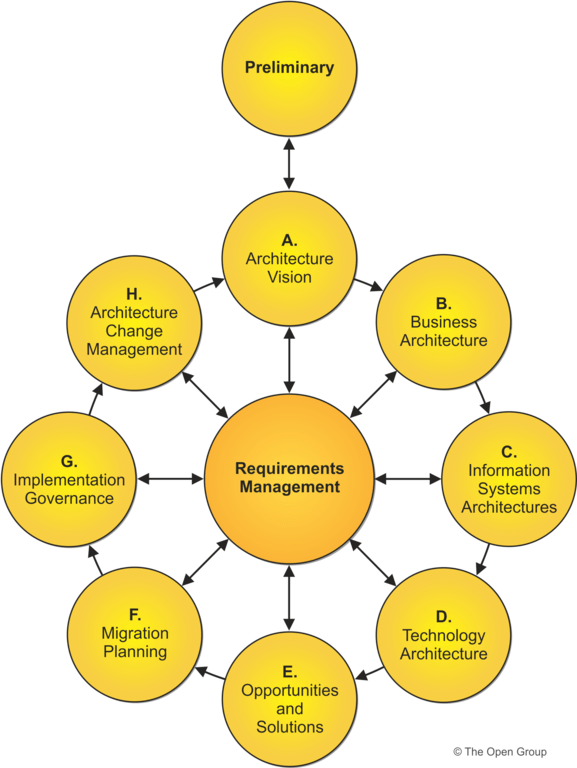 TOGAF is traditionally best known for the Architecture Development Method (ADM) shown as a ‘crop circle’ diagram, and often used along with other frameworks like Zachman for describing the content. Now, with the new TOGAF framework companies have the opportunity to say “Never mind” Zachman and those other frameworks, and just stick with TOGAF for the entire work on enterprise architecture. This TOGAF Architecture Content Framework (ACF) is a major step forward for enterprise architecture, bringing companies closer to achieve the increased control and flexibility of business and technology landscapes that EA is meant to create. Another downside with all those architecture frameworks are in many cases the lack of guidance on how to actually use them. It is great that you can classify all the outputs into some 6×6 matrix, but how do you actually apply that to solve strategic business issues? Define and govern SOAs using the concepts of TOGAF. While no guidance can ever stand alone and the only way to build an architecture capability is to deeply understand, apply and practice the underlying concepts of this discipline, the guidance in TOGAF 9 is certainly enough to get architects started off in the right direction of using TOGAF to address important business issues using enterprise architecture. Many of the various TOGAF ‘resources’ around governance, skills etc. are put together in a separate section and developed further into a ‘capability framework’. These are the major changes to the document, put to market by The Open Group as a ‘modular’ structure where each part can be developed independently. While this is maybe a bit over the top, a clear document structure certainly an enabler for production and could result in more frequent publishing than we have seen with TOGAF since version 8 in 2002 and 8.1 in 2003. Never mind the architecture frameworks – stick to TOGAF 9 for content as well as process. Of course, in a full enterprise-class framework some areas are bound not to be fully defined in the first release. Notably, the concepts of the new content framework are not fully worked out through the other parts of the documentation yet; and developing the various parts of TOGAF independently might prevent the full integration between them, potentially undermining the strength of a full framework. 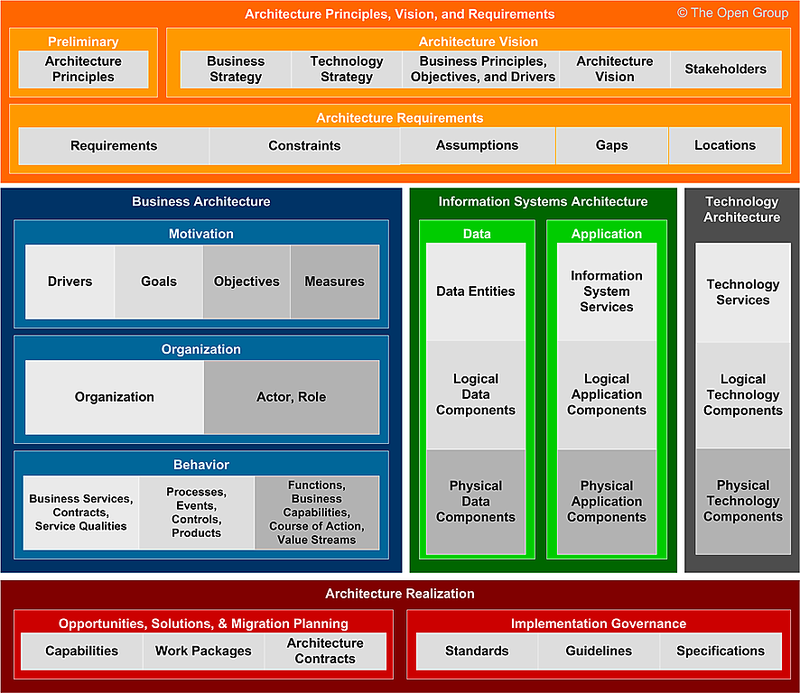 But the key message remains clear: TOGAF 9 presents the first public enterprise architecture framework to cover the full spectrum of content, process and capabilities needed, as well as guidance on how to use it to address specific scenarios such as SOA, security. This entry was posted in Enterprise Architecture and tagged Enterprise Architecture, LinkedIn, TOGAF by carstenras. Bookmark the permalink. Nice blog report about TOGAF 9, gave me a quick and appreciated overview of the subject. Thank you for the encouragement Ron, it’s appreciated! Hi Toke, good to hear from you and thanks! I hope to see some of your views in future discussions. To stay updated, subscribe to the RSS feed on top of the page. Excellent overview. Do you have any recommendations on the first module to start in when beginning first use of TOGAF? Despite the ravages of the bankers (in this article it is definitely spelt with a “b”) we entered the new year with a wonderfully entertaining eruption of passion and fever about architecture that has not been seen for many years. Thank you Anne! You really cheered me up. Now I can claim relief that finally TOGAF9 has reached the public. I trust that the whole architecture community, which has been deprived of a comprehensive framework and set of tools for developing enterprise level architecture, will now be able to adopt a common approach and language to make life much easier for our business sponsors. For too many years IT architects have either been locked up in ivory towers that are impenetrable to most business people or have operated at too high a level to successfully manage the risk of actually delivering IT solutions on-time, within budget and that actually meet the requirements of the business. UML and other modelling languages have been extremely useful for designing software but many software designers and engineers rarely understand the business or makes good enterprise architects. Frameworks intended for a higher enterprise level from Zachmann to TOGAF8 have either failed to deliver because of the paucity of content behind the one slide or have been far too complex for most practitioners to wield in an agile way that business requires. TOGAF9 synthesises elegantly through different abstractions and views most of the tools that an enterprise architect needs. I can say that with some authority having co-developed with many colleagues some important aspects of the intellectual that has been adopted into TOGAF9. I say this not for recognition of myself but to stress that many of the principles and tools of TOGAF9 have been applied very successfully in businesses all over the world for almost a decade now. I consider myself extremely lucky to have been part of this development in some small way; developing from a software engineer into an enterprise architect. Without the genius of the colleagues who I had the good fortune to learn from and work with using these principles and tools I would not be where I am now. Get trained in TOGAF9 now. My current architecture team have just finished a weeks training prepared specially for us and they left inspired and energised. Get a coach and a mentor. As a old mate said “architects hunt in packs”! You can’t do it on your own. You need your designs and principles constantly challenged. If you cannot find one in your own organisation try one of the forums, analyst organisations or even a consultancy. Get a peer group! Develop your own network to share and get feedback on your ideas about architecture. No TOGAF training will give you a recipe book to follow. It will give you a kitchen full of tools to create the best dishes but you will need recommendations from others how to actually cook these. Let’s put some pressure on the tool vendors! Where are your repositories and tools for TOGAF9? The Architecture Content Framework has been available for months. What are you doing? Are you all timid waiting for one of you to move? Come on we need a good repository with a rich web front end. We need good analysis tools and we want to be able to share our Architecture Content between any tool vendor’s repository. Why? Because we work in the real world of delivering solutions and architectures with multiple suppliers, partners and customers. We have to be able to share without restriction the architecture we want to share. So who is going to be first? And who will deliver the best? Like your colleague Serge Thorn, I teach the Architecting the Enterprise TOGAF 9 course. Your comments certainly align with the response I’ve been getting from my participants. I think the idea that TOGAF is finally able to stand on it’s own is key. I’m blogging about TOGAF, especially for the US Government EA community. If any of your readers are interested in this particular slant (obviously much in common with all governmental EA), they can check it out at: http://gtra.org/blog/6273. I enjoyed your posts immensely! You have captured the essence of TOGAF 9 very well.